Offering you a complete choice of products which include stack nest crates, plastic stack and nest crates, foldable plastic small crates, collapsible crates, foldable plastic crates and foldable crates. For movement from DC to Store, Crate is the perfect warehouse-to-store solution. These light, flexible containers can be repacked conveniently with clothing, accessories, textiles and other retail products. Being easy to unload, they help minimize time spent at the store. Integra is the right size for manual handling and stacking by one person. With the inregrated lid flipped to the closed position, it stacks stably. When nested, the volume of Integra is reduced by 70%! Due to the Stack - Nest design of the Container. These Crate bins can be used on trollies as a complete materials handling solution for internal movement of goods as well as Returnable Transit Packaging (RTP) solution too. 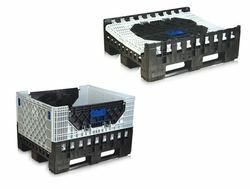 Plastic Stack and Nest Crates Compact base makes it ideal for stable, safe travel on conveyors and other logistics systems. The handgrip design facilitates easy, comfortable manual handling. Containers can be fitted with label areas or code strips for automatic routing. Several versions of lids are available including a foldable lid, which can be flipped to cover the box for nesting. When nested, the volume of Crate is reduced by 70%! Due to the Stack - Nest design of the Container. These Crate bins can be used on trollies as a complete materials handling solution for internal movement of goods as well as Returnable Transit Packaging (RTP) solution too. 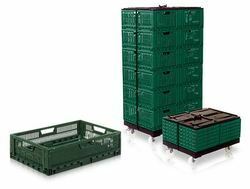 Foldable Plastic Crates are an excellent packaging in the supply chain for fresh food applications. Its straight and rounded inner design protects fruits and vegetables and the curved inner shapes of the side walls improve the usable volume. The optimized folding ratio reduces the return freight costs. Finally, the ribless design brings strength and easy cleaning. These Foldable Plastic Crates are made of Food grade material to meet the requirement of food processing Retail industry. 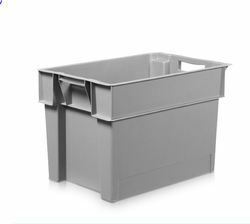 These Foldable Crates Bin can be used on trollies as a complete materials handling solution for internal movement of goods. 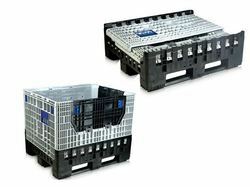 Due to the foldable nature of these Plastic Crates, they can be used for Returnable Transit Packaging (RTP). 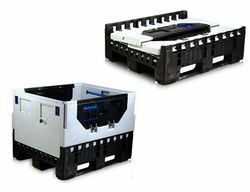 With the supply chain being more challenging than ever before, such as longer transport distances and the effect on the environment, our crates range is the comeplete Returnable Transit Packaging (due to it's folding nature) which offers many advantages over other conventional packaging systems such as one trip systems. These Foldable Large Containers (FLC) are made of Food grade material to meet the requirement of food processing Retail industry. This can also be used in Automobile industry by putting Plastic Dunnage Plastic Fabrication to store heavy automobile components transport the same from OEM to the production facility. The use of foldable/returnable packaging can revolutionise your handling and logistics requirements with many cost effective solutions.